The Realistic PRO-32 is a vintage scanner. Thanks to the spacious layout, it's not to difficult to equip it with a discriminator output. 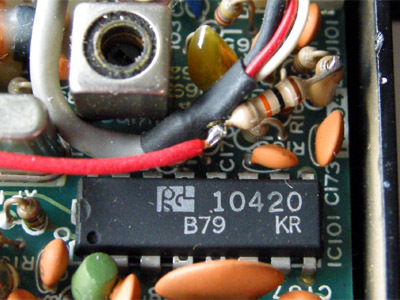 The receiver IC is a TK10420. The unfiltered audio can be found on pin 9. This pin is connected to test point TP104, so soldering to the IC is not required. 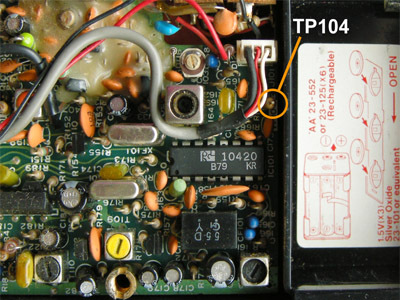 A 10 k resistor is soldered to TP104. A piece of insulated wire is soldered to the resistor's other lead. The earphone socket can be reused. The white and yellow wires to the earphone socked should be detached, connected together and insulated, e.g. with some shrink tubing. Once this has been done, the wire running from the 10 k resistor can be connected to the chassis socket.